It's 1996, and Josh and Emma have been neighbors their whole lives. They've been best friends almost as long - at least, up until last November, when Josh did something that changed everything. Things have been weird between them ever since, but when Josh's family gets a free AOL CD in the mail,his mom makes him bring it over so that Emma can install it on her new computer. When they sign on, they're automatically logged onto their Facebook pages. But Facebook hasn't been invented yet. And they're looking at themselves fifteen years in the future. Okay, so this has nothing to do with the story or how much I liked it, but I just have to get it out there. The female MC was named Emma Nelson and because of that I couldn't stop thinking about Degrassi the entire time I was reading the book. I don't know how many of you watch Degrassi, but Emma Nelson is one of the main characters on that show. I just needed to share that. So...on to the book. I really ended up enjoying this book. 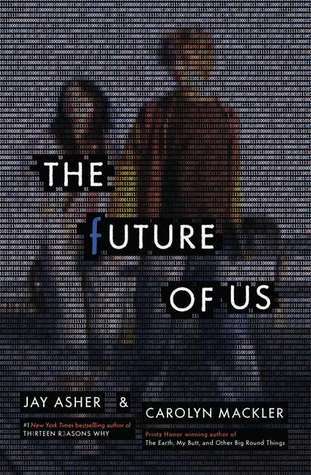 I thought the premise was really cool, I mean who wouldn't be curious about themselves in 15 years? I also thought it was fun that they used Facebook as the portal to the future. It was kind of like time travel because things they did, big or small, affected what was happening in their future. Except they didn't actually have to go into the future. I liked both main characters initially, but as I got further into the story, I really started to dislike Emma. She was so selfish and bratty. Fortunately, she didn't keep me from finishing the story, because she starts redeeming herself and I ended up feeling for her character. Josh was just awesome. He was a nice guy through and through. He also seems more aware of the reprercussions of what they are doing with Facebook and tries to keep Emma in check. Emma and Josh aside, they had the best friends! Kellan and Tyson were hilarious. The two of them were such good friends to Emma and Josh and I wish I'd had more friends like them in high school. I want to read this, so badly, strictly b/c it's set in the 90s. This is such a cool concept. And I'm glad Emma ended up redeeming herself. So happy to hear you enjoyed it! I've been wanting to read it since I read the blurb and now I NEED it! The want is gone... its critical that I get it :) I LOVED 13 Reasons Why by Jay, it was awesome. Great review thanks for sharing your thoughts!